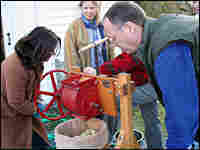 A Down-Home Thanksgiving on the Kimball Farm Chris Kimball, host of the TV show America's Test Kitchen, shares an old-fashioned Thanksgiving from his family farm in rural Vermont. 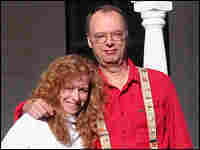 He grew up nearby, where he learned to cook and do almost everything needed for this country feast. 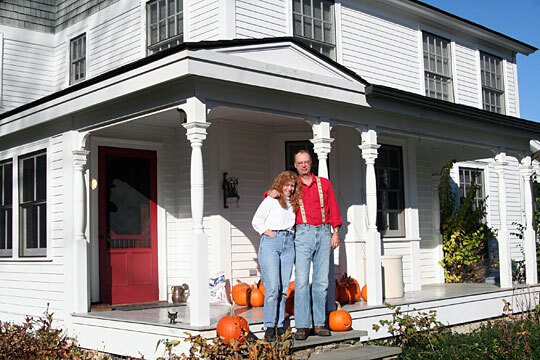 Chris Kimball, host of TV's America's Test Kitchen and founder of Cooks' Illustrated magazine, stands with his wife, Adrienne, on the porch of their farm in rural Vermont. 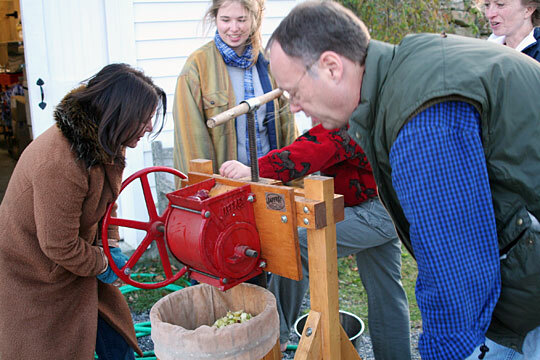 Renee Montagne and Kimball press apples to make cider for Kimball's cider gravy recipe. 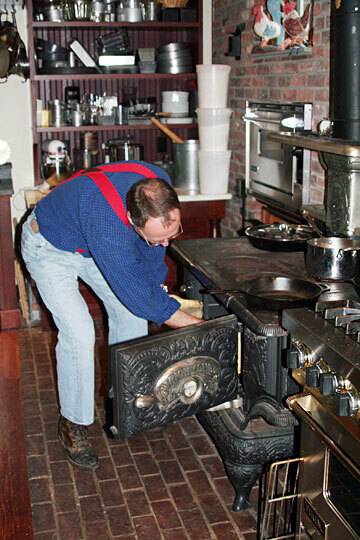 Kimball bakes a pie in the reconditioned Olds and Whipple stove in his farmhouse kitchen. We offer two brine formulas: one for a 4- to 6-hour brine and another for a 12- to 14-hour brine. The amount of salt used in each brine does not change with turkey size. If you're roasting a kosher or self-basting turkey, do not brine it; it already contains a good amount of sodium. Rotating the bird from a breast-side down position to a breast-side up position midway through cooking helps produce evenly cooked dark and white meat. If you're roasting a large (18- to 22-pound) bird and are reluctant to rotate it, skip the step of lining the V-rack with foil and roast the bird breast-side up for the full time. 1. Dissolve 1 cup salt per gallon cold water for 4- to 6-hour brine or 1/2 cup salt per gallon cold water for 12- to 14-hour brine in large stockpot or clean bucket. Two gallons of water will be sufficient for most birds; larger birds may require three gallons. Add turkey and refrigerate for predetermined amount of time. 2. Before removing turkey from brine, adjust oven rack to lowest position; heat oven to 400 degrees for 12- to 18-pound bird or 425 degrees for 18- to 22-pound bird. Line large V-rack with heavy-duty foil and use paring knife or skewer to poke 20 to 30 holes in foil; set V-rack in large roasting pan. 3. Remove turkey from brine and rinse well under cool, running water. Pat dry inside and out with paper towels. Tuck tips of drumsticks into skin at tail to secure, and tuck wing tips behind back. Brush turkey breast with 2 tablespoons butter. Set turkey breast-side down on prepared V-rack; brush back with remaining 2 tablespoons butter. Roast 45 minutes for 12- to 18-pound bird or 1 hour for 18- to 22-pound bird. 4. 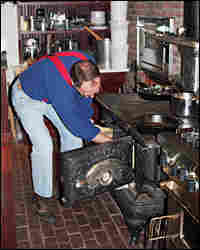 Remove roasting pan with turkey from oven (close oven door to retain heat); reduce oven temperature to 325 degrees if roasting 18- to 22-pound bird. Using clean potholders or kitchen towels, rotate turkey breast-side up; continue to roast until thickest part of breast registers 165 degrees and thickest part of thigh registers 170 to 175 degrees on instant-read thermometer: 50 to 60 minutes longer for 12- to 15-pound bird, about 1 1/4 hours for 15- to 18-pound bird, or about 2 hours longer for 18- to 22-pound bird. Transfer turkey to carving board; let rest 30 minutes (or up to 40 minutes for 18- to 22-pound bird). Carve and serve. Recipes from Chris Kimball and America's Test Kitchen. A basic country stuffing was often made from nothing more than stale bread, salt pork, an egg, hot water, sage, salt and pepper. This recipe is a bit more elaborate, and I have designed it as a master recipe so that you can use any combination of grains, bread cubes, fruit and nuts. Note that this recipe is designed to be baked separately from the bird and therefore it has more liquid than regular recipes to prevent it from drying out in the oven. Since it only takes a half hour to bake, it can be put into the oven at the point the turkey is done, since the bird should rest for 20 minutes before carving. This recipe can easily be doubled or tripled for larger crowds. 1. If using homemade bread, it should be chopped into 1/2-inch cubes and then spread out onto a baking sheet in one layer. They should be baked in a 225-degree oven for 25 to 40 minutes, depending on the type of bread, until they are dry and hard. Or, simply leave them out on the baking sheet for 2 to 3 days. 2. Heat the butter and olive oil in a skillet and saute onions for 5 minutes over medium heat. Add celery and scallions or chives and saute for 2 minutes. Mix together all ingredients in a large bowl. Prunes and raisins must be soaked in hot water for 5 minutes before draining and chopping or they may be soaked in a 50/50 mixture of sherry and water for 2 hours. 3. Heat oven to 375 degrees. Butter a 2-quart baking dish and add stuffing. Cover with aluminum foil and bake for 15 minutes covered. Remove aluminum foil and bake for an additional 15 minutes or until the stuffing is brown and crispy on top. Cider gravy is an old recipe, dating back at least as far as Fannie Farmer. (You can find it in her original 1896 cookbook. However, I have started over with this recipe, simply altering the basic Thanksgiving gravy with the addition of cider. I prefer to make my own stock on Thanksgiving day by slowly simmering the giblets, not including the liver, in lots of water in a medium saucepan. It is even better if you cut up the pieces (neck and wingtips in particular) and saute them briefly in some oil before adding the water. As soon as the turkey is done, remove turkey and rack from roasting pan and pour off the drippings into a tall, narrow container or measuring cup. Let rest for 15 minutes so the fat rises to the top. Place the roasting pan on two medium burners and saute the shallots for 2 to 3 minutes until soft. (If your roasting pan cannot be placed directly onto burners, you can use a skillet instead.) Meanwhile, spoon off the fat from the drippings and discard. Reserve 1/2 cup of the defatted liquid. Add the chicken stock, cider, reserved drippings and thyme. Adjust heat to maintain a simmer and reduce by one-third, scraping up any bits on the bottom of the pan. Add salt and pepper to taste. Knead softened butter and flour together into a paste and whisk into gravy to thicken. Simmer for a couple minutes more and check seasonings before serving. You can make these potatoes an hour in advance. Once the half-and-half has been added in step 2, place a clean kitchen towel over the pan and cover with the lid. Let sit for up to an hour. About t10 minutes before serving, remove the lid and towel and place the pan over low heat, stirring often, until piping hot. If the potatoes have stiffened or dried out a bit, add small amounts of extra butter and half-and-half. This recipe can easily be doubled. 1. Place potatoes in large saucepan with water to cover by one inch. Stir in one teaspoon salt. Bring to boil over high heat; reduce heat to maintain simmer and cook, covered, for 15 minutes. Add the turnips and cook 15 minutes longer or until a paring knife or skewer can be poked in and out of potatoes with little resistance. Drain. 2. When potatoes are cool enough to handle through double thickness of paper towel, use paring knife to peel and cut into quarters. Pass potatoes and turnips through ricer or food mill back into warm saucepan. Add butter, half-and-half, remaining salt and pepper, and stir gently until fully melted and well combined. Place over low heat and stir often until potatoes are very hot, 2 to 4 minutes. Taste for seasoning and add additional salt and pepper if necessary. Sprinkle with Onion-Anchovy-Parsley Topping and serve immediately. Don't be afraid of the anchovies. They add flavor but not a fishy taste. Heat oil and butter in large skillet over medium heat. When butter foam subsides, add anchovies, reduce heat to medium-low, and cook for 2 minutes. Add onions and salt, cover, and cook for 20 minutes. Remove cover and cook an additional 10 minutes or until the onions are very soft and lightly browed around the edges. Stir in parsley and keep warm. If you do not have a cast-iron skillet, the bread can be baked on a baking sheet, although the crust won't be quite as crunchy. Soda bread is best eaten on the day it is baked but does keep well-covered and stored at room temperature for a couple of days, after which time it will become dry. 1. Heat oven to 400 degrees and adjust oven rack to center position. Combine flours, soda, cream of tartar, salt and sugar in large mixing bowl. Add butter, using your fingers to rub it into flour until it is completely incorporated and mixture resembles coarse crumbs. Make well in center of flour mixture and add buttermilk. Using fork, work liquid into flour mixture until dough comes together in large clumps. Turn dough onto work surface and knead briefly until loose flour is just moistened. Dough will be scrappy and uneven. 2. Form dough into 6- to 7-inch round and place in cast-iron skillet. Using paring knife, score deep cross on top of loaf and place in oven. Bake until nicely browned and toothpick comes out clean when inserted into center of loaf, 40 to 45 minutes. Remove from oven and brush with melted butter, if desired. Cool for at least 30 minutes before slicing.